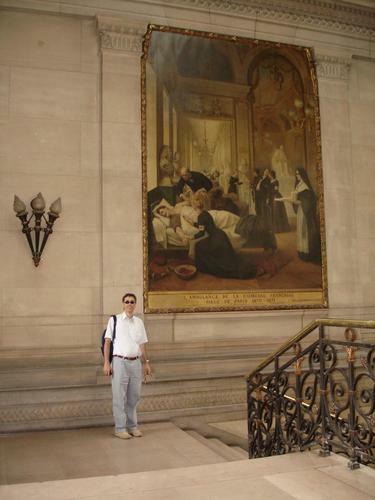 This big oil painting represents the infirmary (fr. : ambulance) organized in the foyer of the Comédie Française, during the siege of Paris, in 1870. Also the famous actress Sarah Bernhardt took care of the wounded in this infirmary. It was painted in 1891 by French painter André Brouillet and can be seen at the top of the honour staircase of the Université Paris Descartes in Paris. As can be read on the frame, the painting was a gift by the eclectic physiologist and 1913 Nobel Prize for Medicine, Charles Richet: he wanted to honour the memory of his father, the physician Didier-Dominique-Alfred Richet, Professor of Clinical Surgery in the Faculty of Medicine, who in the painting is represented in the act of assisting a wounded soldier. 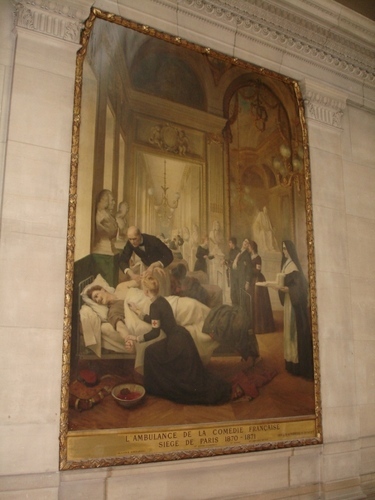 An other famous painting by the same Author - "Un Leçon Clinique à la Salpêtrière" (1887) by André Brouillet - can be seen in the same building. Sarah Bernhardt did'nt take care of the wounded in this ambulance, but founded the ambulance of the Théâtre de l'Odéon ("Second Théâtre Français"), during the Franco-Prussian War, in 1870 (before the Siege of Paris, actually). This theatre is just a short distance from the actual René Descartes University.